Begin this easy walk at Adams Park at the intersection of Main Street (VT 7A) and Center Hill Road. There is free parking around the park. This three-tenths of a mile route slopes gently downhill, and the terrain is city sidewalks. End at the Factory Point Town Green on Depot Street, overlooking the spillway on the Battenkill. Drawing waterpower from the Battenkill, which you’ll see more of as you walk along, there were at various times a gristmill, tannery, textile mills, sawmills, marble works, tin shops, cheese and butter makers, furniture makers, carriage works, blacksmiths, and a distillery operating along the riverbanks. That explains the original name, Factory Point. So, while enjoying the view of the high ridge of the Taconic Mountains beyond, start this walking tour by looking for the bronze plaque that is mounted on a boulder in Adams Park. It states that Harry L. Adams was “an outstanding citizen whose life centered around this park for 90 years.” His residence, built in 1806, still stands at 18 Park Place. 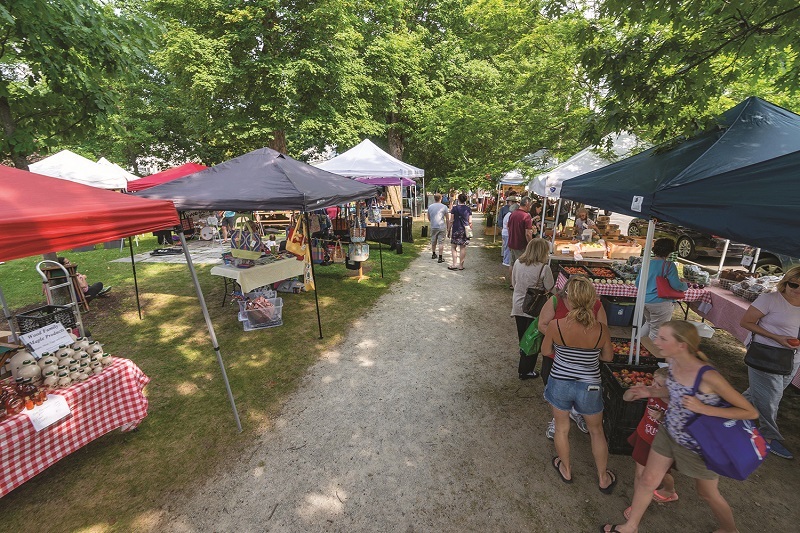 Adams ran a business dealing in “Watches, Clocks, Jewelry, Spectacles, Sewing Machines and Musical Goods.” If you’re in Adams Park on a Thursday afternoon in the summer or fall, it bursts with activity as local growers and food producers arrive for farmers’ market day. From the park, glance across the street at the restaurant, 5103 Main Street. 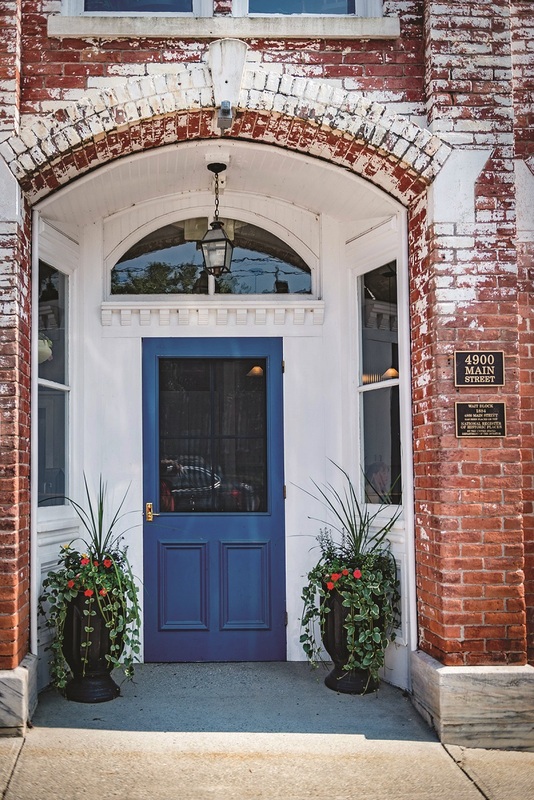 This attractive, twin-chimneyed brick building is quite early, dates back to the 1840s. It is called the Zullo House, for a family that lived there for a time, but Myron Clark built it. He is best remembered as the businessman who made Factory Point “a thriving part” of Manchester, and, as president of the Bennington & Rutland Railroad Company, Clark was instrumental in bringing the line to Manchester in the mid-1800s. Fifty years later, electricity came to Manchester; population around that time: 1,955. Leaving Adams Park, walk south on Main Street along the even-numbered side of the street in the direction of the mountain, and keep a sharp eye for traffic. 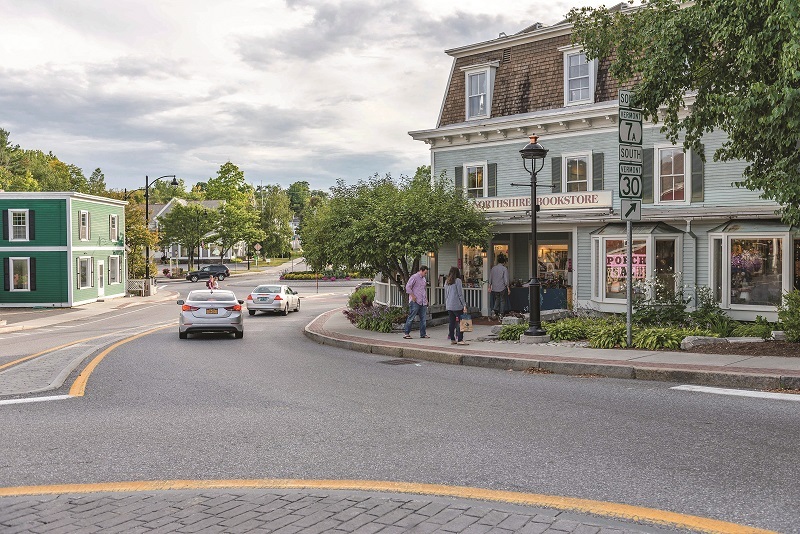 Architect and historic preservationist Bill Badger, of Badger and Associates in Manchester, says, “There was an enclave of better homes around what is now the park, and for a long time, on the side of the street where Finn & Stone is now, there were no buildings. There was a long gap and a big marble retaining wall over a steep drop to the river.” He says walking along here “you would have been looking into the abyss,” while on the opposite side of the street there were fields and farmhouses. “Down over the hill, you came to the shops and industries,” he says. The “abyss” is still there but the wall is not—directly behind the row of buildings on the even-numbered side of Main Street there is a deep ravine. Continue along Main Street; stay on the even-numbered side. 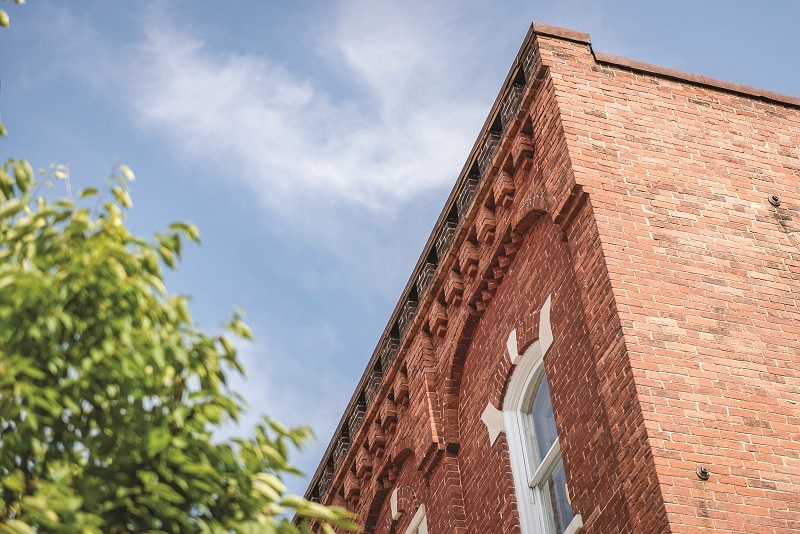 Take a moment to enjoy some of the architectural details on the buildings across the street, for example, the brickwork on the cornice at 4935 Main Street. The workmanship of these unknown 19th-century masons is still worth studying. As time went by, each of these buildings housed various businesses. Factory Point Place, 4928 Main Street, was superbly renovated four years ago for mixed use as retail-residential. It was Estabrook’s Opera House in 1896, and it, too, has had an assortment of occupants over time. Look up at the decorative details around the entryway and on the upper stories. 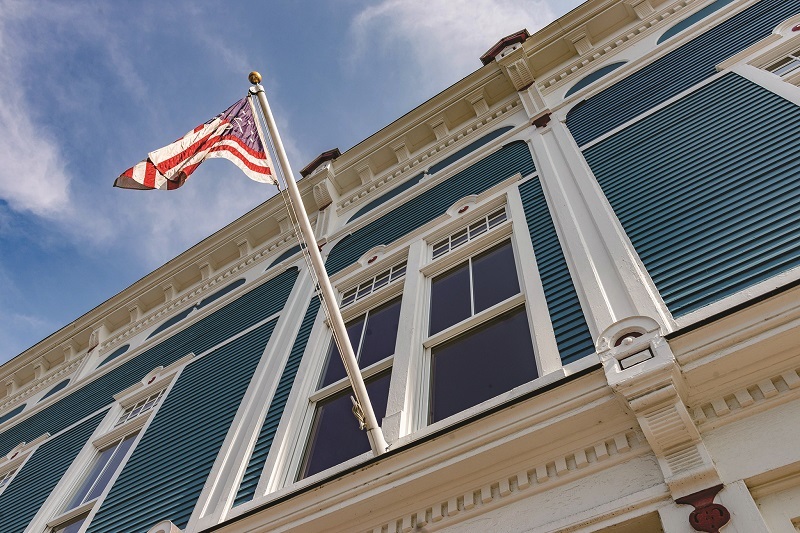 Here again, the heavy cornice with its brackets, dentil molding, and mezzaluna cutouts, plus the use of color accents on some of the architectural elements, gives the whole façade a delightful personality. The Manchester Country Store, 4915 Main Street, has a charming touch of scrollwork on the corners just under the eaves. All of us are enticed by the goods in the shop windows at street level, so we tend to overlook small details such as these that make a city or town interesting. Remember to always take a quick glance at the sills and lintels on windows and doors, and look for unusual elements on upper stories and along rooflines. See if you can guess which parts might be original, and those that were added later. In 1885, Clark Wait built Wait Block, 4900 Main Street. (A building with divided interior spaces is referred to as a block, as in “apartment block.”) Wait operated a drugstore. Listed in the National Register of Historic Places since 1996—look for the official plaque—this three-story brick building is “vernacular Italianate-style.” Note how the marble details at the window arches enliven the upper stories on the facade. In its day, Wait Block would have been justly admired as a sophisticated edifice for Manchester Center. 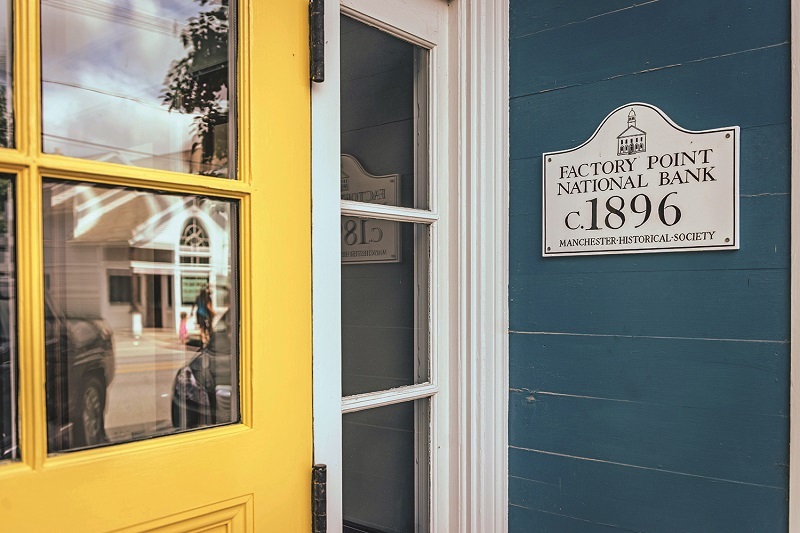 In the recessed entryway at 4886 Main Street, a brick building built in 1837 as a general store, look for large letters on the glass above the door. This was the Combination Cash Store Company starting in the early 1900s, and the letters give us one small hint about the building’s history. A gristmill was typically one of the first mills that new settlers of a township built. 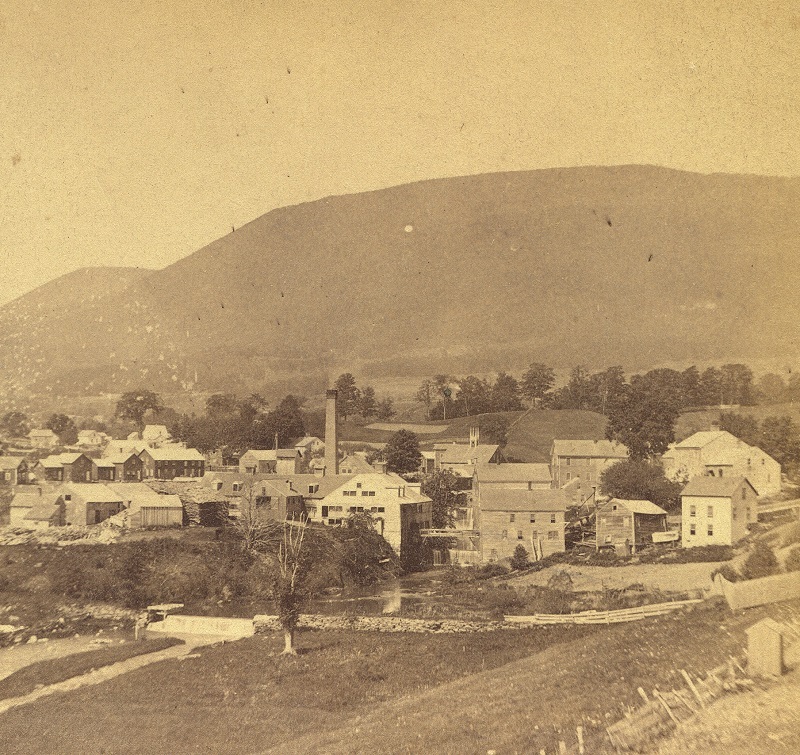 The stone mill, 4858 Main Street, part of which is now Mountain Media, dates to circa 1820. Timothy Mead’s name appears in the early land records for the heart of Manchester Center. He acquired some 200 acres. Before the district was known as Factory Point, people called it Mead’s Mills—the mills Mead operated in the 1790s ran on waterpower at this spot. 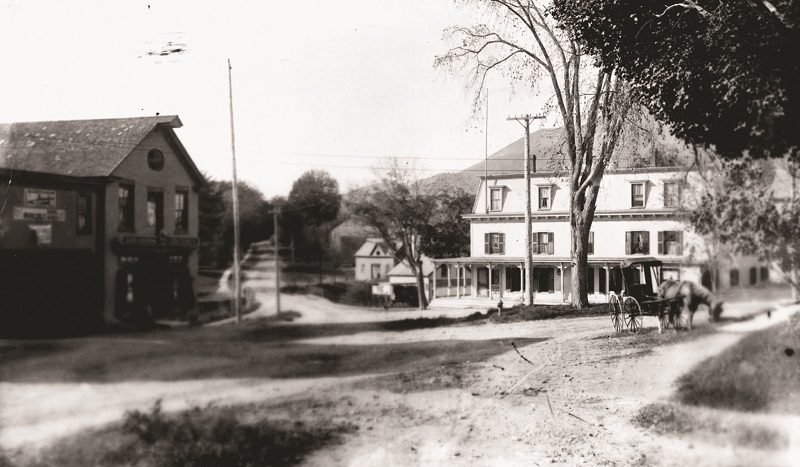 The popular Northshire Bookstore, 4869 Main Street, was long known as the Colburn House, an inn dating to the 1870s. Again, the nearly century-and-a-half-long chain of deeds shows different uses by successive owners. Originally, the wraparound veranda was entirely open, and inside, there was a dance hall on the third floor, under the distinctive mansard roof. Turn left before the roundabout. 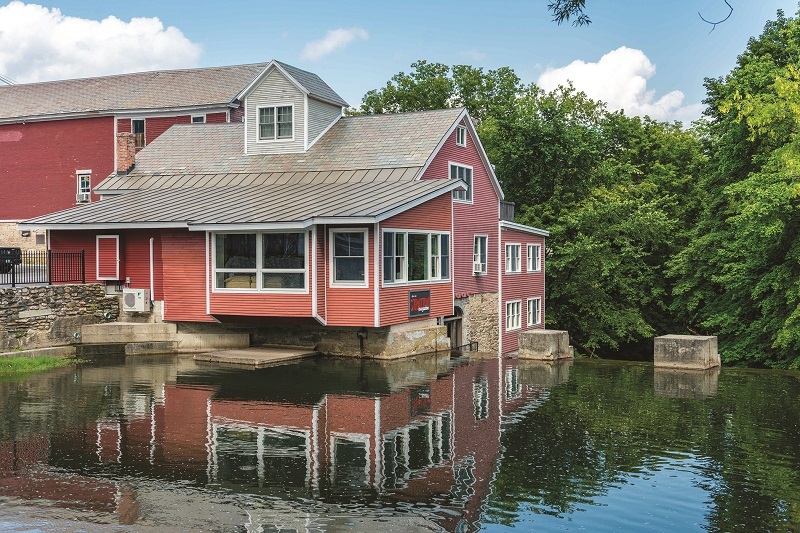 You have a much better view of the gristmill from the center of Center Bridge, above the mill pond and dam. Much of the area that is now the car dealership on the other side of the roundabout was also flooded for the mill pond when the industries were fully operating. The Battenkill appears to be a minor waterway on some maps, but it was actually a hardworking river when it was tapped as a source of power. Cross Center Bridge; turn left into Factory Point Town Green, and walk along the sidewalk closest to the river. The pathway is part of Riverwalk. Here, you have a scenic view of the spillway and the gristmill. 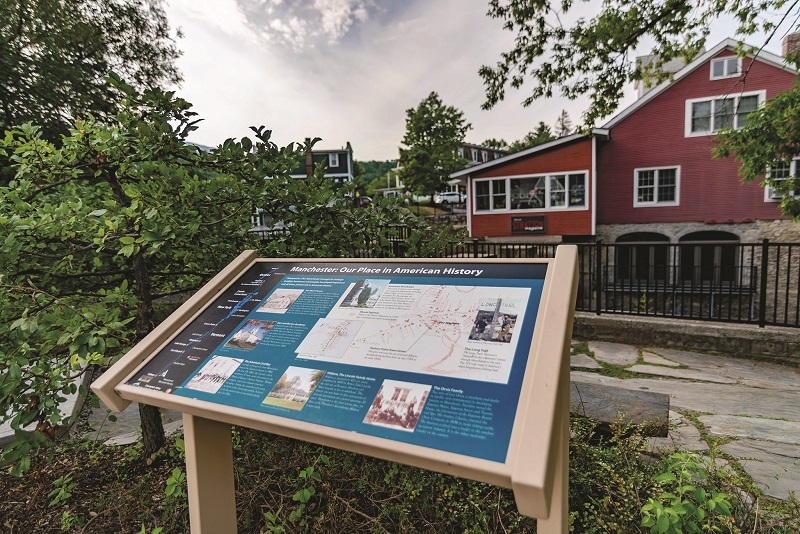 Look for the information panel along the sidewalk—it tells about Manchester’s place in America’s history. Continue past the bandstand until you come to railing at a spot overlooking the river’s natural banks. 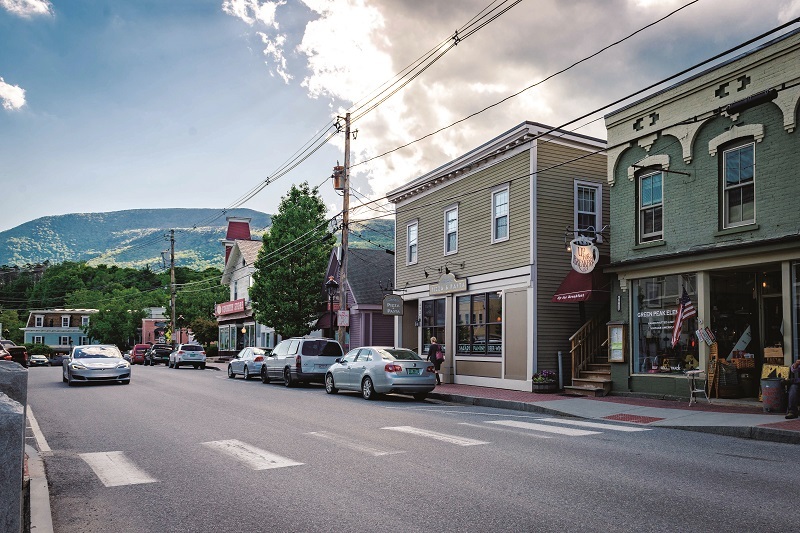 Here you can see the steep slope on the opposite side, and you will realize that the backs of the buildings along Main Street are high above. 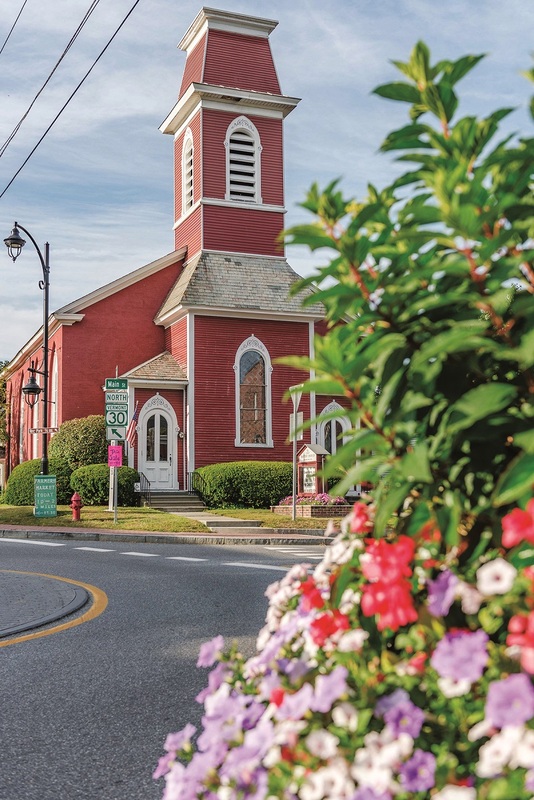 This town green, re-landscaped about 30 years ago, was not always so open, so pretty, or so green—until about 1890, it was the site of a huge, positively foul-smelling tannery operation. In old photos, its big, square, 60-foot, brick smokestack towers above the surrounding rooftops, and yet, “the Grand Old Equinox” dwarfs it in the distance. Are they mills or factories? Mills generally process raw materials into usable commodities, while factories make finished goods and merchandise. For example, a mill processes bales of cotton into spools of thread and bolts of cloth, and then a factory uses the thread and cloth to make dresses. Download the Stratton & Manchester Area Guide app for in-depth historical perspectives from MHS.